Submitted by bfara83 on Wed, 05/07/2008 - 3:50am. 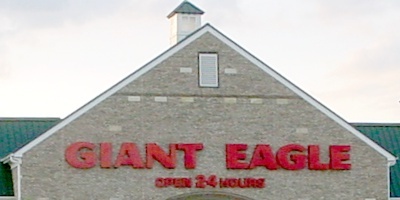 All 223 Locations from Giant-Eagles Web-Site. Please email me at bfara83@gmail.com if you have any questions, if you see any coordinates that are wrong or missing/closed locations for this POI. GE,City, State "Hours" (Departments) Phone Number. *Note* Some times will be different on Saturdays/Sundays then what it shows in this POI. Changed order to show hours after (City, State). Brunswich, OH location: Added Ticketmaster as a store option and Corrected Hours. Butler, PA Moraine Pointe Location: corrected name Point should be Pointe. New Castle, PA Wilmington Location: Corrected Hours. Alliance, OH Location: Corrected Hours. Bainbridge OH Location: Corrected Hours. Willowick OH Location: Corrected Hours. Berea OH Location: Corrected Hours. Northfield Center OH Location: Corrected Hours. North Royalton OH Location: Corrected Hours. Strongville OH Location: Corrected Hours. Twinsburg OH Location: Corrected Hours. Hilliard OH Location: Corrected City, should be Dublin. Columbus OH, Lincoln Village Location: Missing Hours. Erie PA, Peach St. Location: Corrected Hours. North Madison OH Location: Corrected Hours. Pittsburgh, PA E. Hills Location: Corrected Street, should be Frankstown Rd. Monroeville PA, Hills Plaza Location: Corrected Plaza Name, should be Ames Plaza. Greensburg PA, Eastgate Plaza Location: Corrected Hours. Latrobe PA Location: Corrected Hours. Pittsburgh PA Pine Creek Location: Corrected Street, should be McKnight Rd. Pittsburgh PA, Caste Village Location: Corrected Hours. West Mifflin PA, Century Plz. Location: Corrected Hours. McKees Rocks PA Location: Corrected Hours. Boardman OH Location: Corrected Hours. Poland OH Location: Corrected Hours. Corrected a few missing phone numbers. Corrected hours for a few locations. Corrected phone number for Columbus, OH on Neil Avenue. Sorted locations by areas in POI file. First Release - All locations in US. There are currently 6 users and 64 guests online.